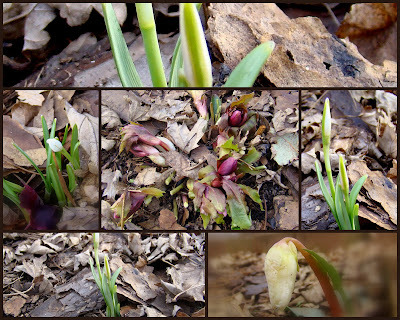 This post is inspired by Jan, who is hosting the second annual Garden Bloggers Sustainable Living Project in honor of Earth Day on April 22nd. To participate and/or to see more garden bloggers' posts on sustainable living, please visit her where she blogs at Thanks for Today. When Mom and her Garden Buddy retired and moved north to rural southwest Wisconsin, besides (of course!) planting a large vegetable garden which provides nearly all of of their produce needs during the season, they preserve much of the surplus, which lasts until the next harvest. They've established a wonderful web of local, sustainable, organic farmers who provide them with pasture-raised eggs, dairy, meats, and some of the fruit they don't grow themselves. I've long wished I could find the same kind of food, but alas, here in Chicago's south suburbs, the best we could do for a long time was to grow some of our own vegetables and shop for organic food at local health food stores. Homewood Kitchen Gardens at the last farmers market of the 2010 season. They grow organic herbs, vegetables, and flowers in their yards(!) 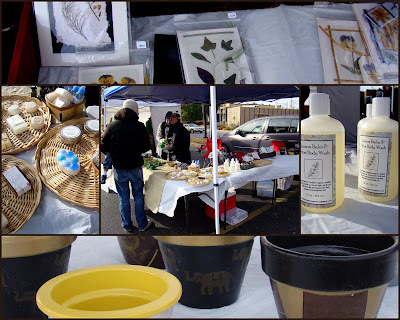 to sell at the market, and create chemical-free soaps, body washes, candles, insect repellent, nature-inspired artwork, and other wonderful products. Fortunately the food landscape here and in many urban and suburban areas throughout the country is gradually changing. People who want the best quality, sustainably, organically, locally-produced food now often have more options. Our own, and every surrounding little burg now has a farmers market. While organic produce is still not as readily available in our local farmers markets as I'd like, there are a few vendors who are selling organic food, and those are the ones I patronize. Even a small garden can be surprisingly productive, especially one built with raised beds filled with really healthy soil and lots of compost. Here in our raised beds,every inch is used. Succession planting increases the yield. Containers add valuable real estate to our vegetable growing space, and are used by many small-space vegetable gardeners and urban farmers for growing some of their own food. All our veggies are heirloom varieties started from seed, grown organically. Some are started from seeds I save from year to year. Buying clubs and CSAs (community supported agriculture,) are thriving in the south suburbs and NW Indiana, and becoming more readily available in urban and suburban areas around the country. Our local health food store, and a little local mom-and-pop grocery with a much larger-than-average percentage of local, organic, and sustainably-produced food fill in the gaps. Using these wonderful resources, I've opted out of the industrial food machine. Although looking for alternatives to large grocery store chains, purchasing from a variety of sustainable resources, and cooking from scratch can be time-consuming, the benefits far outweigh the effort. Once the systems are in place, it becomes easy, efficient, and routine. Since ramping up efforts to seek sustainably-produced local food, my health has improved. And, it feels so good knowing who, and where our food comes from, and knowing it's being produced without chemical toxins like artificial hormones, antibiotics, fertilizers, fungicides, herbicides, test-tube additives, and without genetically-modified ingredients. For others who would like to get creative with their food supply, discover a rapidly-growing community of like-minded eaters, get to know the dedicated farmers growing wholesome foods in their area, and seek local, sustainably-grown produce, pasture-raised eggs, poultry, dairy, and meat, Eat Wild and Local Harvest provide information and resources for finding local farmers, buying clubs, co-ops, and farmers markets. Have fun, and enjoy the flavors, fragrances, textures, colors, and environmental and personal health benefits of REAL FOOD! Thank you Jan, for hosting the second annual Garden Bloggers Sustainable Living Project. May we all be a little, or a lot more inspired to do as much as we can to live in harmony with Mother Earth. We need her a lot more than she needs us. Truth alone will endure, all the rest will be swept away before the tide of time . . . You must not lose faith in humanity . . . Growing up in a family of farmers and organic gardeners, and being a life-long organic vegetable gardener myself, I've always been passionate for sustainable, healthy living. My parents, four siblings and I spent our early years living in a 2-flat on Chicago's north side, and moved to our little house with the big yard in the spring when I was ten years old. Our first big family projects in our new home were building a very large compost bin and a huge vegetable garden. We grew up on organic vegetables, and local, free-range chicken and eggs Mom bartered for in exchange for her excellent sewing skills. Mom and her Garden Buddy still grow a large vegetable garden. Most of the rest of their food comes from local organic farmers. For some of our other groceries, Mom shopped at the local health food store, and a local farm stand, long before the days of the prolific farmers markets that continue to pop up all around the Chicago area and around the country. Almost everything we ate was fresh, whole, slow food. Even though we lived in an inner-ring suburb with little nearby farm land, we were locavores as much as possible in those days, long before those terms were coined and those concepts were trendy. As young children, we came home from school every day for a freshly-prepared, wholesome lunch. Our cream-top milk from a local dairy was delivered in glass returnable bottles along with eggs, butter, and other delicious, farm fresh food. After we moved to the suburbs and carried our (re-usable) lunchboxes to school, our lunches were made from whole foods and fresh fruits and veggies. Snacks besides vegetables, nuts, fresh and dried fruit were almost always homemade. (I still have fond memories of Mom's healthy and delicious oatmeal-raisin cookies, homemade bread, and whole-grain pizzas!) Our sandwiches were made from wholesome ingredients on brown breads while our friends were eating processed cold cuts, Wonder Bread and Twinkies. My own three girls were raised on the same kinds of fresh, whole, wholesome foods, and got to grow up experiencing the pleasure of fresh garden vegetables, often eaten still warm from the sun. There was little room for boxed, canned, and other processed foods in our house, and there were times the girls, like their mom, aunt, and uncles before them were envious of friends who were growing up on the prolifically advertised and touted-as-modern-and-convenient heavily-processed boxed, frozen, and canned foods, and sugary sodas. Ding Dongs and orange cheese doodles were a lot more popular at school than fresh fruits and vegetables and real-food homemade snacks. We were the kids no one wanted to swap lunches with. Just as I had, my daughters grew up on fresh, mostly homemade and home-grown slow food. Even then, organic was our first choice for everything that didn't come from our garden. As adults they have adopted these same kinds of choices in how they feed themselves and their own young families. They're grateful for having been raised as 'conscious eaters.' They understand the importance of, and know how to provide themselves and their families with whole, health-sustaining, as unadulterated-as-possible, nourishing foods. Over the years, the SAD (Standard American Diet) has become even more nutritionally-deficient, artificial, chemical-laden, inferior, and filled with cheap, health-robbing, government-subsidized commodity ingredients. Processed, convenience, and fast foods are produced by the enormous, highly-profitable US industrial food system and are pesticide-laced, artificially-colored and flavored, high in sugar, preservatives, hydrogenated and trans fats, genetically-modified, stripped of nutrients, and then, incredibly, fortified with cheap synthentic, poorly-assimilated isolated vitamins and minerals that cannot possibly take the place of whole, natural, fresh food. Farm animals in this country are mostly raised in industrially-run CAFOs (Confined Animal Feeding Operations,) where they are fed horribly unnatural, genetically-modified diets supplemented with unspeakable garbage, treated with antibiotics, artificial and genetically-modified hormones, and housed in unnatural, often filthy environments, crowded and barely able to move, and often standing, sitting, and lying in their own waste. It's no wonder food-borne illness has become such a huge issue in our country. Food-borne illness takes a huge toll when it strikes families and individuals. It kills. When it doesn't kill, it can leave it's victims with chronic, incurable diseases. I am one of the unlucky individuals who learned this first-hand. The waste from CAFO-raised animals is a huge problem which pollutes our water, air, and soil, and damages the quality of life in surrounding communities where the toxins and stench they unleash into the the environment lead to health problems for surrounding residents, especially the most vulnerable: the children. Antibiotics fed to livestock raised in these unnatural conditions are contributing to the dangerous rise in antibiotic-resistant superbugs like MRSA and certain strains of e-coli. It's little wonder the United States now ranks 49th in the world for life expectancy, down from 24th in 1999, and 11th in 1986. Two years ago the US ranked 28th in the world in infant mortality, down from 12th in 1960. For the first time in US history, today's young children can expect shorter lifespans than their parents, and are suffering from a host of health conditions virtually unknown in previous generations. Diet-related obesity and diabetes are afflicting our children at rates never seen before. And while the population of the US and the world is growing unsustainably, the alarmingly increasing rates of infertility and miscarriage are probably not the most desirable means of population control. The US industrial food system is producing disease and our health care system is broken. Our air, water, and food are filled with dangerous toxins, and factory farming and industrial food are major contributors to these problems. Here in the United States, the unholy alliance between our government and industrial polluters, Big Ag, and Big Pharma has led to a seriously broken system that is taking a huge toll on human, animal, and environmental health. Genetically-modified foods are being unleashed into our environment and into our food without proper, ethical scientific evidence of their safety. The news is not good. As gardeners we may be in more direct contact with the natural world than the average person. We know the importance of organic and sustainable gardening - for the sake of our soil, our pollinators, and the other wildlife that visit our gardens, and for the health our of pets, our families, and our own health. Most of us know that pesticides, herbicides, and fungicides are not healthy for the natural world, of which we are inextricably a part. More and more of us are using organic, sustainable gardening methods. More and more of us are learning of the importance of native plants for the health of our soil and our beleaguered pollinators. More and more of us are planting open-pollinated heirlooms in our vegetable gardens, saving and swapping seeds, and going organic from seed to table. And more and more of us are becoming activists and advocates for local, organic, and sustainably-produced food. Home vegetable gardening is growing in popularity, and encouragingly, more and more young people are becoming sustainable, organic food gardeners and farmers. In Part II, I'll talk about how I've opted out of the unsustainable industrial food system as completely as possible. 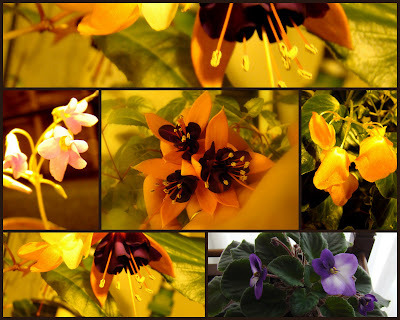 The usual suspects are blooming away happily indoors, paying no attention to the vagaries of Chicago area's typical mid-March weather. Pictured are oxalis, fuchsias, dragon wing begonias, and African violet. The violet bloomed for three months straight, took a 2-week rest, and is blooming again. The others have bloomed all winter. And the fuchsia is still healthy! I killed the last two with kindness the last two winters. Going easy on watering in winter seems to be the trick. They're thirsty outdoors, but indoors in winter they seem to like drying out thoroughly between watering. A very happy (almost) spring Bloom Day to all, and thank you to Carol for hosting. For more Garden Bloggers' Bloom Day posts, please visit her at May Dreams Gardens. The Chicago Flower and Garden Show opened this weekend, and runs through next Sunday, March 13th at Navy Pier. The weather outside the Pier, especially on Saturday, was frightful. Inside the exhibition hall one could forget about the snow showers and 70-MPH wind tunnel gauntlet she walked through crossing the last street before reaching Navy Pier's entrance. 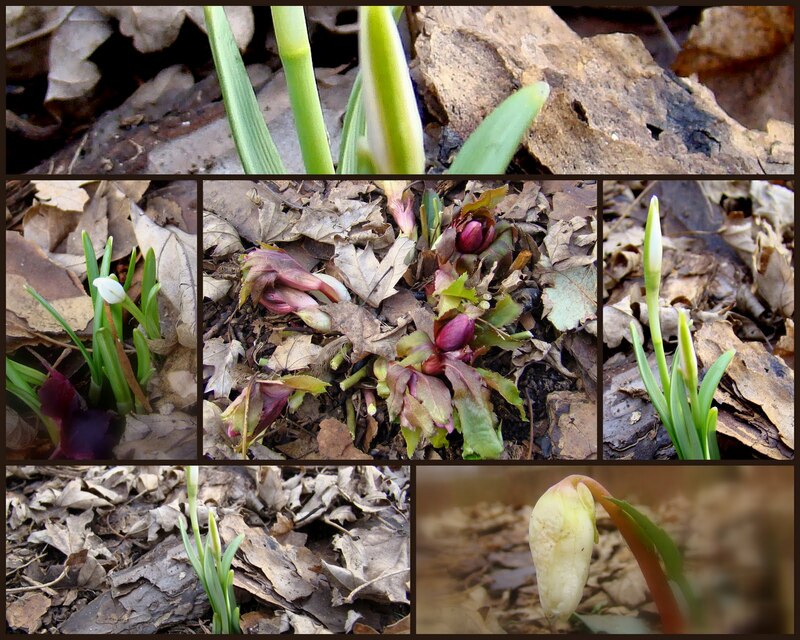 The cold and bluster of Chicago's lakefront was soon replaced with the fragrance of hyacinths, exotic tropical blooms, and hardwood mulch, and all the sights and sounds of the official start of Chicago's gardening season. The best part of the show for me was the opportunity to meet up and hang out with new and old gardening friends - too many names to mention them all! So much time was spent socializing on Saturday, I'm glad I went back on Sunday to take in more of the show. Plenty of time was spent socializing again on Sunday - this time with a smaller group. We enjoyed lunch together, and most of the rest of the time was spent making the rounds of the exhibits. With so many photos, the slideshow seemed like a good format to cram in as many as possible, and I hope you enjoy it!